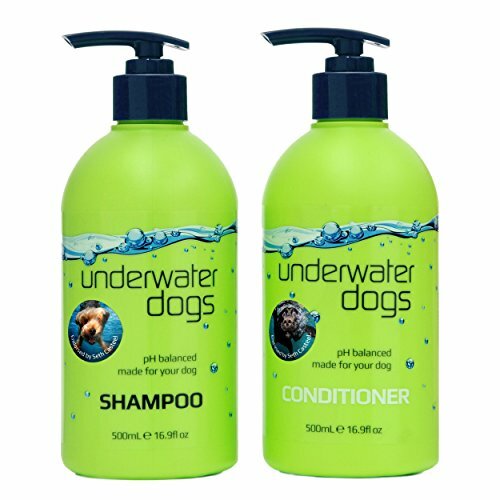 Underwater Dogs Shampoo & Conditioner is designed for dogs who still play like a puppy and love to get dirty. This combo pack has an 8.4 Fl. Oz. bottle of Dog Shampoo & an 8.4 Fl. Oz. bottle of Dog Conditioner. Our dog wash and moisturizer are professionally formulated & soap-free, containing unique blends of pH balanced ingredients, adding softness and shine to your dog’s coat. A naturally soothing formula, deliciously fragranced with vanilla and coconut-ice. Underwater Dogs Shampoo gives a thorough yet gentle wash. Reducing irritation for those with dry and sensitive skin. Underwater Dogs will leave your dog feeling so fresh, so clean and smelling like a coconut-vanilla ice-cream on those long Dog Days of Summer. Soap-free and quality pH balanced ingredients will clean thoroughly without damaging your dog’s delicate acid mantle. Bringing softness and luster to their coat while maintaining natural oil equilibrium. Delicately fragranced with coconut and vanilla, this product will have your fuzzy buddy back in their favorite spot... On your bed, before you know it! How To & How Often Should You Wash Your Dog? Consider bath time like bonding time and bond as frequently as possible! To connect with your pal just add warm water and apply Underwater Dogs Shampoo. Then give a loving massage. Rinse thoroughly. Just like your own beauty routine, conditioner detangles and locks in moisture while combating dry and flaky skin. Our professionally formulated dog conditioner locks in moisture, helping with tangles and matted coats, conditioning both hair and skin. Nourish your dog’s hair and skin, while giving long-lasting freshness between baths. Get with the pack and become an Underwater Dog today! Want the best smelling dog on the block? Vanilla-coconut fragrance smells delicious and will last between baths. Professionally formulated, pH balanced and soap free dog shampoo for itchy skin. Reduce your dogs discomfort with safe and effective ingredients. Moisturizing dog shampoo and leave in conditioner is a deep clean for the dirtiest dogs. Leaves their coat soft, shiny and easy to detangle. Easy to use pump bottles reduce bath time. Both products lather nicely and reach the entire coat. Rinses off easily and cleans very well. 100% Money Back Guarantee - Relieve your dogs itchy skin with product that works. If it doesn't work after a month, we will refund your money and give you advice on other treatments. If you have any questions about this product by Underwater Dogs, contact us by completing and submitting the form below. If you are looking for a specif part number, please include it with your message.